Water based high gloss system that provides a smooth, tough and durable top coat. For use on both interior wood and metal. Approximate coverage 10-12m2 per litre. 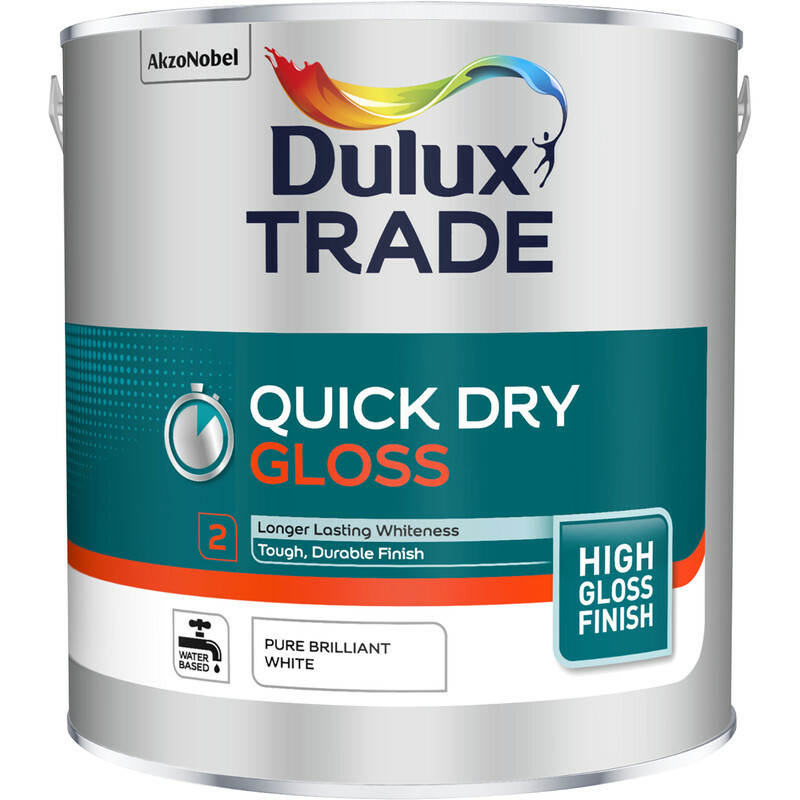 Dulux Trade Quick Dry Gloss Paint Pure Brilliant White 2.5L is rated 4.4 out of 5 by 31. Rated 5 out of 5 by Kans from Best paint I bought this to paint my new pine doors after undercoat and I was surprised only needed one coat and my door look brilliant but make sure you use wd roller for best look and brush for corner. Rated 5 out of 5 by Skywalker 09 from Will never use solvent based gloss again. Have always used Dulux solvent based Trade High Gloss paint because of its outstanding finish. However thought I’d try the Dulux Trade waterbased gloss when decorating an open plan living room and kitchen. It behaves differently from its solvent based counterpart requiring a quicker speed of application and is slightly less forgiving when laying off. However it genuinely is dry within the stated six hours, you can wash your brushes out in water and perhaps most importantly the odour is minimal and what there is disappears quickly. The actual finish is almost compatible with the solvent based high gloss so the Dulux water based quick drying gloss paint is for me a complete no brainier. Rated 5 out of 5 by Ross CJ from Worth every penny! Ive never liked glossing, this paint makes it a lot easier to cope with. When its dry it looks and feels exactly lIke a perfect normal gloss paint. Its easier to paint on as its runnier. Brushes clean out with water. It says it dries in an hour, not quite, its touch dry in a couple and best left overnight to prevent finger print marks. Compare that to normal gloss, sometimes 2 weeks later would leave imprints! As for coverage i gave bare MDF skirting 3 coats for a decent finish but they werent primed so thought this was reasonable. Rated 5 out of 5 by Bengeo boy from Excellent product Excellent product, superb price and great delivery. Rated 4 out of 5 by Montereydave from Dulux Trade Gloss Good coverage but it needs two coats to be effective, but does dry very quickly.